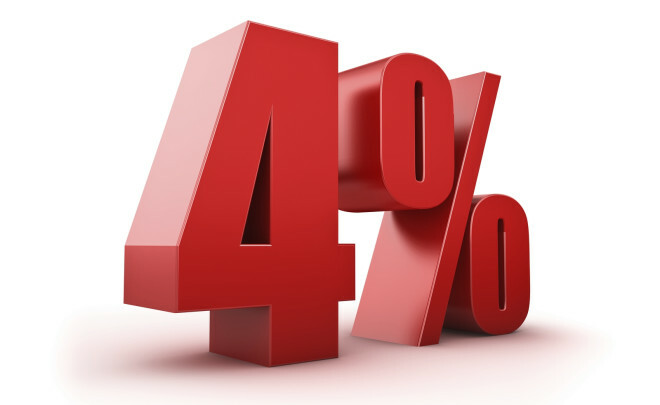 Real Deal Retirement » Blog Archive » How Does The 4% Rule Work—And Should You Follow It? I hear people refer to the 4% rule for withdrawals in retirement, but I don’t know how you actually follow it. Do you just withdraw 4% of your nest egg’s value and increase that amount by inflation each year? What if the market drops and your nest egg’s value falls? Do you take 4% of the lower value or continue increasing the original withdrawal by inflation? I’m confused. You’re not alone. Despite how often the 4% rule is mentioned in stories about how much you can “safely” draw money from your nest egg in retirement, many people still aren’t sure about the particulars of the strategy. So I’m going to do two things in this column. First, I’ll try to explain how and why the 4% rule came about and clarify how it works. I’ll then address the more important question of whether the 4% rule works. Or to put it another way: Does it make sense for you or anyone else to rely on this regimen when turning savings in 401(k)s, IRAs and other retirement accounts into spending cash? The 4% stems from a 1994 study by financial planner William Bengen, who was looking for a way to help clients figure out how much they could draw from their nest egg each year to fund retirement without running through their savings prematurely. After testing a variety of withdrawal rates using historical rates of return, Bengen found that 4% was the highest rate that held up over a period of at least 30 years. Here’s how the rule works: You start by withdrawing 4% of your nest egg, by which I mean the value of all your investments earmarked for retirement. For example, if you have a total of $500,000 in all your retirement accounts, your initial withdrawal would be 4% of $500,000, or $20,000. But in order to maintain your purchasing power in the face of rising prices, you would then increase the dollar amount of that first withdrawal in subsequent years to reflect the impact of inflation. So if annual inflation is running at, say, 2%, your second year’s withdrawal would equal $20,400 ($20,000 plus 2%), the third year’s draw would be $20,808 ($20,400 plus 2%), the fourth year’s would be $21,224 ($20,808 plus 2%) and so on. You would continue along this path, increasing the prior year’s withdrawal by inflation, regardless of how the market is doing and whether your portfolio is rising or falling. A couple more nutsy-boltsy issues: If you receive any dividends, interest or other distributions paid to you in cash (as opposed to reinvested in your portfolio as additional shares), those payments would be considered part of your withdrawal. So, for example, if in a given year you planned to withdrawal $20,000 and you received cash payments of dividends and interest of, say, $10,000, then you would withdraw an additional $10,000 from your nest egg to reach your target withdrawal of $20,000. And once you reach age 70 1/2, remember that you must satisfy the IRS’s minimum withdrawal requirement for 401(k)s, IRAs and similar accounts, even if doing so would mean exceeding the amount you would withdraw in order to stick to the 4% rule. Otherwise, the IRS could hit you with nasty penalty equal to 50% of the required amount that you failed to withdraw. As for the question of whether you should follow the 4% rule, the answer is a little trickier. Just because the rule held up in the past doesn’t guarantee it will in the future. And in fact, a 2013 paper titled “The 4% Rule Is Not Safe In A Low-Yield World” suggests that given today’s low yields and anemic expected rates of return, an initial withdrawal rate closer to 3% may be more appropriate if you want your nest egg to support you at least 30 years. But there’s another wrinkle to the 4% rule that many people don’t focus on—namely, that if the market performs decently, the value of your nest egg could swell dramatically if you strictly adhere to the 4% rule, perhaps leaving you with more money late in life than you started with when you retired. In a post last year about the 4% rule on his Nerd’s Eye View blog last year, financial planner Michael Kitces noted that, historically, more than two-thirds of the time a retiree following the 4% rule would have had more than double their starting principal at the end of 30 years. The possibility of ending up with a hefty nest egg late in retirement may not seem like reason for worry. (It might even be cause for your heirs to celebrate.) But it could mean that by sticking to the 4% rule you unnecessarily stinted early in retirement when you could have been spending more freely and living larger. So while not running out of savings is a worthy retirement goal, it’s not your only one. You also want to live well on the money you worked so hard to earn and save during your career. It would be nice to be able to identify in advance a level of withdrawals that will meet your retirement income needs, assure that your money will last a lifetime and not leave you with a huge stash of assets in your dotage (along with regrets that you hadn’t spent more early in retirement). But there are too many variables and unknowns—how the market will perform, how long you’ll live, whether your spending will keep pace with, exceed or lag inflation, what sort of unanticipated expenses you’ll run into, how well your health holds up, etc.—to allow for such precision. So I recommend starting out with a reasonable withdrawal rate—as well as an appropriate mix of stocks and bonds given your risk tolerance—and then adjust as you go along. What’s reasonable? That’s s judgment call, but I’d say 3% to 4% is a decent place to start if you want your savings to be able to support you 30 or more years. You can go with a higher rate or a lower one. Just remember that the lower your initial rate, the less income you’ll have to meet your spending needs and the more likely you could end up with a big retirement account balance late in life. Conversely, starting with a higher rate will provide a more comfortable lifestyle, but could subject you to a greater risk of outliving your savings. In setting your initial withdrawal rate, you’ll also want to consider how much of your expenses you can cover from Social Security and any pensions, what other resources you have to draw on (home equity, income from an annuity, cash value life insurance, income from a part-time job) and how much of your retirement spending goes to essential expenses that you would have a hard time trimming vs. discretionary items that leave you with a lot more leeway cutting back should you need to in the future. Once you’ve decided on a withdrawal rate, you should be ready to boost or cutback your withdrawals based both on your spending needs and how much your nest egg’s value is rising or falling. If a severe market setback or a string of subpar returns has put a serious dent in the value of your savings, you may want to cut back on your planned withdrawals or not boost them for inflation for a year or two to give your savings balance a chance to recoup lost ground. On the other hand, if the financial markets have a good run and the value of your retirement assets surges, then you might consider boosting your withdrawals a bit. By going to a good retirement income calculator that uses Monte Carlo analysis estimate how long your savings will last and plugging in your updated savings balances, spending plans as well as some other information, you can get a good sense of whether you need to adjust your scheduled withdrawals up or down and, if so, by how much.